Great news! OG’s Speculative Fiction, Issue 21 has been released! In Brian Anglin’s “Forget Me Nots” a man lives two lives and loves two women, but which one will win out? D. Thomas Minton’s “Memories of Childhood” tells the story of man struggling to find his missing memories and the reason they are missing. 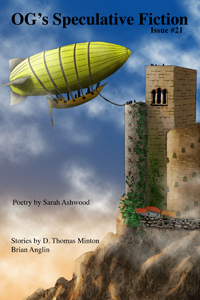 Also included is poetry by Sarah Ashwood. Let us know what you think of the issue! Don’t miss our other issues of OG’s Speculative Fiction if you haven’t read them.